Are you earning what you should be earning? A new offering from LinkedIn is aimed at helping you find out. LinkedIn Wednesday announced the launch of LinkedIn Salary, which includes information on salaries, bonuses and equity data for specific job titles, as well as factors that impact those salaries, including experience, industry, company size, location and education level. The information comes from LinkedIn’s user base, and the professional network assured users that when they enter their salaries, they are encrypted and remain private. LinkedIn Salary is now available to all users via desktop and mobile web in the U.S., Canada and the U.K., with plans to roll the feature out worldwide in 2017. 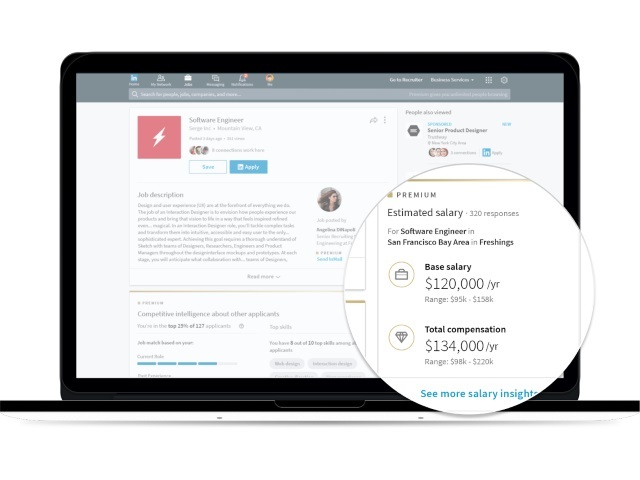 LinkedIn Premium members will be able to access LinkedIn Salary without providing their salary information, and they can also filter jobs via LinkedIn Salary data. See top-paying locations: Know what locations pay the most for specific jobs and see the number of job openings there. For example, a registered nurse in Sacramento, Calif., gets paid an average of 50 percent more than in New York. Understand which educational requirements matter: When considering furthering your education, you can better assess how important a master’s degree versus a bachelor’s degree is. For example, marketing directors tend to see some of the largest salary increases from obtaining an MBA. See which industries pay the most: There are several opportunities that are impacted by industry. For example, the highest-paying industry for sales representatives is healthcare. See salaries for the top companies: Know more about the compensation for companies you’re interested in and be the first to know about job openings through following their company page. Understand how company size affects pay: View how pay differs for job titles depending on company size. For example, you could earn more as a project manager at a large company versus a midsized one. Readers: What are your initial impressions of LinkedIn Salary? LinkedInSalary from SocialTimes on Vimeo.